Protective clothing covers the main area of the human body. The need for protection depends on its anticipated use conditions, and often protection against several types of hazards is needed at the same time; physical, chemical, biological, poor visibility, or danger of drowning for instance. However, in addition to being protective, the clothing must be comfortable, durable, and washable. To meet all these requirements, we must develop or select the right material, combine different materials correctly, and design the garment so that it fits the end-user properly. Physiological aspects and user behaviour must be taken into account to fulfil ergonomic requirements and to ensure the correct use of the clothing. The cost of the clothing (including the price of the garment, washing and maintenance) must be reasonable. Appearance is also important; it should please the user and also co-workers. In addition, the clothing image can function as psychological armour, e.g. a special uniform in service tasks. Protection of the worker is most effective when the clothing is suited to the job, adequately maintained, and is worn properly by a user who has been trained to use it. This is supported by the Systematic Personal Protective Equipment (PPE) Management Program, which covers everything from selection to the disposal of the clothing. The Finnish Institute of Occupational Health (FIOH) is a multidisciplinary research and specialist institute on occupational health and safety. The main functions of the Institute are research, specialist advisory services, training and the dissemination of information. Research on personal protective equipment (PPE) has been carried out since 1978. Together with the end user, we have carried out research and development projects on protective clothing for different occupations e.g. clothing for firefighters, workers in the metal industry (welders and foundry workers), electricians, meat cutters, cold store workers, construction workers, shop workers, farmers and soldiers. We are currently studying fire fighters' protective clothing and protection against hot chemical splashes for recovery boiler workers in the pulp industry. In the study on fire fighters' protective clothing we compare the thermal strain of fire fighters while wearing tasks fitted vs. EN 469 protective clothing systems during a prolonged rescue drill. Test method development against hot alkaline splashes is one part of our study of recovery boiler workers' protective work wear development. The training of the end users and manufacturers of protective clothing is also an important part of the activities of the FIOH. Courses on protective clothing have been organised annually since 1980. The participants of these courses are end users, safety personnel, buyers, manufacturers, designers. The FIOH provides testing and certification of PPE. The Department of Physics of the FIOH has been a Notified Body (no. 0403) for PPE since 1994 and also for the Marine Equipment Directive since 1999. Testing services have been accredited by the Finnish Accreditation Service (FINAS) since 1994. After the reorganisation of the FIOH as of 1.1.2006, the Notified Body is now situated in the Protection and Product Safety team. The FIOH has a number of international activities. It actively participates in the co-operation of Notified Bodies and the CEN and ISO standardisation work of PPEs. Dr Mäkinen is the chairperson of the ESPC (European Society of Protective Clothing). Every third year the ESPC organises conferences on protective clothing. The next one will be held in Poland, Gdynia on the 10-12th May 2006. More information about the conference can be found at www.ciop.pl/ECPC. In the 1980s, before the European Directive on PPEs came into force, protective work wear was not always regarded as real personal protective equipment. Only certain occupations were covered by national regulations for protective clothing, e.g. fire fighters. In the beginning of the 1990s, in nine working groups (WG), the CEN Technical Committee (TC) 162 prepared the first standards for different types of protective clothing. Today there are 12 working groups in TC 162, the latest one being the WG for diving suits. These working groups have prepared over 100 clothing and glove standards for the requirements and test methods of protective clothing and gloves. In the beginning, most requirements were based on the material tests. Now there are human sized dummies equipped with sensors for measuring certain properties of protective clothing. Some standards today also include practical performance tests which are carried out in the laboratory using test persons. 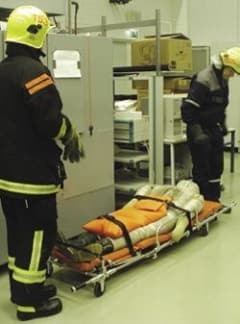 Trials in the field, with physiological measurements and questionnaires, are normally performed during research programmes or the designing of new types of products; these can also be carried out during the selection process of protective clothing in a company. The FIOH is able to perform measurements at all the above levels. The protective properties of materials against heat, cold, mechanical actions, water, chemicals, and visibility can be tested by material measurements. When evaluating the results it must be taken into account that measurements are performed in the standard laboratory environment, and in normal use situations the air layers, for instance, can be very different. Material layers can be pressed differently, and the temperature and air velocity in use situations are very different to standard laboratory conditions. The permeation tests for chemicals according to standards are normally performed with single chemicals, as opposed to the chemical mixtures that are often the case in real use situations. On request, the permeation can also be performed with chemical mixtures at the FIOH. Mechanical properties such as durability are normally only measured for materials. Test results can be used for the ranking of materials, but cannot be used to predict the durability of a material in real working conditions. Table 1 summarises how wear properties can be measured and assessed, and the measurable terms for evaluation. According to standards, material measurements are normally performed on materials after 5 washing cycles. The tendency in standard revisions is to perform this pretreatment-washing according to the manufacturers' information, with the maximum number of washing cycles. This makes it difficult for the end user to compare and rank materials, because washing procedures before material measurements can be very different and cannot simulate the real use situation. The materials were traditional FR 100% CO, 50/50% CO/PES, 75/25% CO/Kevlar, 55/45% PPAN/CO and 35/65% Conex PBI/FR CV. The service life of garments made of all these materials was 78 - 110 use-hours at the shipyard and they had a maximum of three use washing cycles. The results showed that it is very difficult to simulate normal use by laboratory washing. But after a 10 times cycle of washing and UVC/ozone exposure for 8 hours, similar strength values were received as after 2-3 normal use-washing cycles at the shipyard. Instead of increasing washing cycles, parallel exposure to UV/ozone could give a more realistic indication of the suitability of flame retardant fabrics to welders' protective clothing. Thermal manikins are used to study or to test the relation between the clothing and the thermal environment. They can be so-called dry manikins, able to measure only convective and radiation heat loss, or they can be sweating manikins, which can also measure heat loss through sweating. Measurements can be made using either standing or moving manikins. Thermal manikin measurements are required in EN 342 which is standard for cold protective clothing. Instructions for how to use the thermal insulation values measured by the thermal manikin must be supplied with the user information. The second type of manikins are manikins instrumented for prediction of burn injury. These are used to study or predict the protection of heat protective clothing against fire and heat. Immersed manikins are used to study and measure the insulation and tightness of diving and immersion suits. There are also dummies in the size of babies for testing life jackets for children. In addition, there are heated and sweating foot-, hand- and headmodels to study the thermal properties of footwear, gloves and head protectors. The simplest laboratory measurements with test persons consist of practical performance tests for checking the ergonomic features of protective clothing. The test persons simulate the normal work position, and we examine the suitability of the clothing. In physiological studies, the test persons perform planned trials, and we measure different physiological parameters e.g. heart rate, skin temperature, rectal temperature and sweat loss. This is followed by questionnaires on perceived exertion, thermal comfort and sensation, and test persons can make suggestions for the development of the design. Although these tests with human beings are more complicated and expensive, the benefit is that we receive real, useful feedback. from the end user. During the design process, the wearer trials help to assess the compatibility and ergonomic suitability of the protective clothing. Wearer trials can also be performed during the selection process of work wear. When these trials are conducted systematically, and the users represent the relevant occupational group, the final selected garments are better accepted by the whole intended user group. The trial time should be long enough to cover all the seasons. In this way the suitability for different weather conditions is controlled, and the durability in use and after laundering is checked. Protective clothing must be selected, used and maintained correctly in order to ensure the intended and designed protection. The selection should be based on proper risk assessment and evaluation of the ways to eliminate or reduce the level of hazards. The characteristics of the users and the working environment need to be considered. The efficient and proper training of the users is a prerequisite for the correct use of protective clothing. Care and maintenance, as well the competence of those responsible for it, will ensure the protection level and usability of the clothing during its entire service time. All steps of selection, use, care and maintenance should be carried out systematically and should be integrated into the existing quality/safety management system to ensure that all requirements are properly taken into account in daily management. Work places should have specified procedures and work instructions for risk assessment, purchasing, training and control activities. The next sections explain the elements of systematic procedures from risk assessment to the selection and use of work wear. More often than not, companies subcontract protective clothing services from specialised companies, with specialists providing help in the selection and development process. The management system should also include criteria and control procedures for subcontractors. After hazard identification, risk estimation and evaluation are to be carried out for each hazard by determining the elements of risk. Work practices, job procedures, equipment, work place layout, individual factors, employee interviews, work site observations, and interpretations of technical and hazard information play a decisive role at this stage. A checklist is a good tool to make sure that all hazards are identified and exposure levels defined. It is essential that production personnel, supervisors and workers are involved in the assessment. Often the evaluating process can be helped by consulting occupational health professionals, professional hygienists, physicians or nurses. It may also be necessary to use external specialist services for defining exposure levels. surveillance, records of hygienic measurements, etc. Particular attention should be paid to job criteria in order to identify the user's needs and select the appropriate work wear. The PPE procedures should be gathered into written records, which are audited regularly and continuously developed. The record should involve also the care and maintenance of PPE. It is useful to develop and introduce the programme gradually, in parts which can then be combined to form a PPE programme. Also, different parts may serve as separate PPE programmes. It is good practice to write down the rules and guidelines for use of the PPE needed for a certain task in the work instructions. In addition, there are many specific questions according to the PPE type. Table 2 shows these factors in the selection of protective clothing for poor visibility conditions. It is very important that the workers themselves are involved in the selection process evaluating various models at the workplace through selected trials. This procedure brings information regarding fit, comfort and user acceptability. The PPE should be individually assigned. PPE with a maximum degree of protection does not protect if it is not used correctly, e.g. due to poor fit. To avoid arguments as to why protective clothing is needed, users must be informed of the reasons, through, for example, lectures and seminars on work environment and use of the PPE, films, face-to-face discussions, demonstrations in the wearing of the PPE, individual fitting programmes for special sized workers. Training can be carried out on an individual basis or in group meetings. Workers are instructed to use the PPE to achieve the necessary level of protection and to know the limits of the work wear. Safety equipment suppliers often help in this type of promotion, as this process must support the company's PPE policy. In addition to the users, supervisors, purchasers and storekeepers also need training on PPE. During the training, the manufacturer's information on the types of PPE are checked to make sure that they are understandable to the workers. Training should be supported with regular refresher courses. Without proper maintenance, the effectiveness of the PPE cannot be assured. This element in the PPE management programme should cover inspection, rules for replacement of the PPE in cases of degradation, repair, care, cleaning, and proper storage. The programme should include clear instructions as to when the workers can repair the work wear themselves, and when an authorised person is needed, etc. The programme must be audited regularly. To monitor the success of a PPE programme, review questions in the form of a checklist can be given to users to complete. A positive attitude among top management, as well as all other levels of the organization, is necessary for continuously setting a good example. After any changes in the work environment, the machines, chemicals and the needs of the PPE programme etc. must be reviewed. After a successfully completed PPE programme, the personnel at all levels of the enterprise should be aware of their responsibilities. Where and how to store the PPE ? Mäkinen H, Karkkula S, Jaakkola K, Von Nandelstadh P, Can laboratory pre-treatment of welders' protective clothing simulate their aging in normal use? Journal of ASTM International (JAI). http://www.astm.org/May 2004, vol 1, no 5, paper ID JAI12121.